New Smyrna Beach Mayor Russ Owen (L) presented $5,800 scholarship awards to Nicholas Antedomenico (R) and Julia Cejas (not pictured). 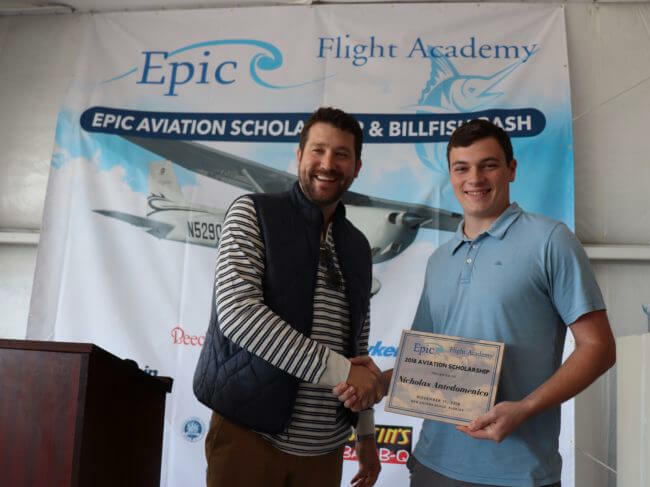 Hundreds of aviators and aviation enthusiasts were in attendance for Epic Flight Academy’s 3rd Annual Aviation Scholarship and Billfish Bash on Saturday, November 17th as two young aviators were awarded scholarships and offshore fishing tournament teams were recognized. Florida high school students are invited to apply for the scholarships each year. 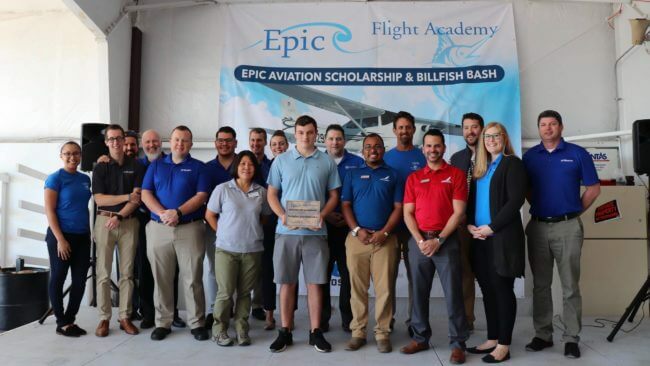 To date, Epic Flight Academy has awarded $70,000 in scholarships. The event combines fishing with flying as anglers participate in the two-day Billfish Bash tournament to raise funds to support young aviators. Attendees were able to visit information tables sponsored by Textron Aviation, Piedmont Airlines, Air Wisconsin Airlines, and Daytona State College while enjoying barbecue, raffles, and a silent auction. New Smyrna Beach Mayor Russ Owen was on hand to present the scholarship awards. Nicholas Antedomenico, a senior at Jupiter High School who has already earned his private pilot license, received a $5,800 scholarship to support his flight training. He has logged 50 instrument hours, serves as Battalion Commander for Jupiter High School’s Army JROTC, and is the Civil Air Patrol FL-152 Cadet Squadron Commander where he has won the Amelia Earhart and Billy Mitchell Awards. Nick has logged more than 200 hours of community service while maintaining a high GPA and competing on his school’s varsity swim team. Nick has been commended by one of his flight instructors for his character, integrity, and desire to serve others. Julio Cejas, a 16-year old student at Pembroke Pines Charter High School, also received a $5,800 scholarship. He was hiking in the Grand Canyon during the scholarship festivities, so he was unable to attend the award presentation. Julio has demonstrated his determination and commitment to flying, volunteering with the Coast Guard’s Air Station in Miami and the Civil Air Patrol in Miami Beach. He has actively sought out aviation mentors and has been praised for his depth of character, sense of responsibility, and intellectual curiosity. Julio’s main goal is to become an HC-144 pilot for the Coast Guard. He is a scholar-athlete and is on several sports teams at school. 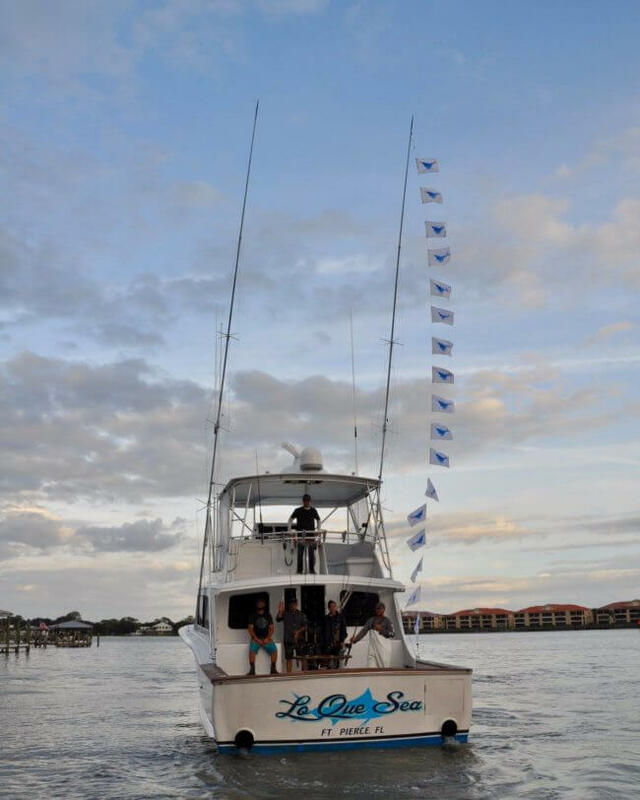 Billfish tournament winners were: 1st Place Boat Team – Lo Que Sea (22 fish); 2nd Place Boat Team – Bonna Vear (13 fish); 3rd Place Boat Team – Hall Pass (10 fish). Other teams and catches included Waterproof (9), Miss Emma (8), South Wind (6), Better Together (6), and Lori A Di (3). Top Aggregate went to Miss Emma, Junior Angler was won by Dillon Lindsly, and Lady Angler was won by Crystal Langworthy. See more photos of these amazing teams here. Plans are already underway for the 4th Annual Aviation Scholarship and Billfish Bash, which will again benefit Florida high school students who are interested in flying. Lo Que Sea won the 3rd Annual Epic Flight Academy Billfish Tournament with 22 total catches/releases, with 17 on the second day. Representatives from Air Wisconsin Airlines, Piedmont Airlines, Textron Aviation, and Daytona State College join Epic CEO Danny Perna, New Smyrna Beach Mayor Russ Owen, and scholarship recipient Nick Antedomenico in this group photo.